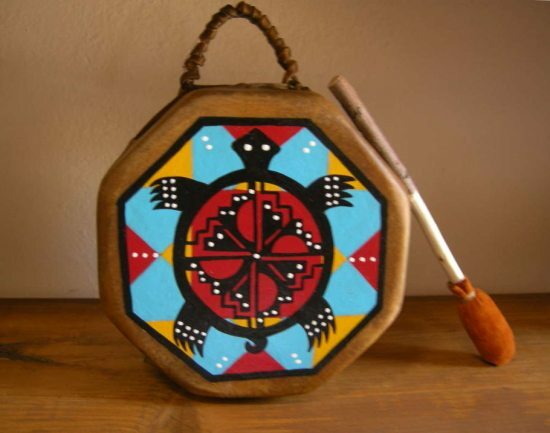 Small Dual-Sided Turtle Hand Drum. $125. Grandmother Turtle wears an ancient “kiva steps” pattern on her shell on this small dual-sided hand drum. Perfect for either adults or children, the drum bears symbols of water and the Four Directions, and comes with a traditional beater. Drum by Elk Good Water (Taos Pueblo); artwork by his wife, Dolly Concha (Zuni Pueblo). Posted on Sunday, June 15th, 2014 at 6:59 pm. Filed under: Drums	RSS 2.0 feed.